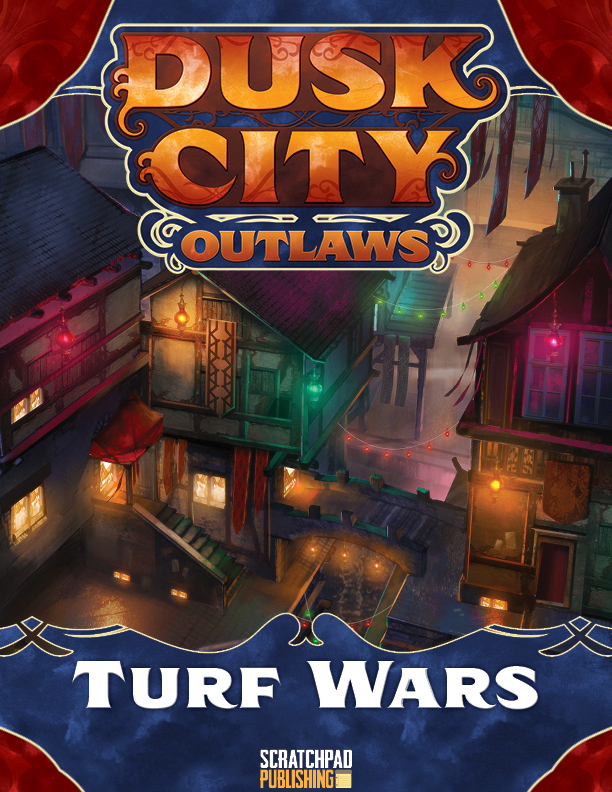 The Turf Wars supplement for Dusk City Outlaws expands upon the core game's campaign rules and adds new options for long-term play. In a Turf Wars campaign, all members of the crew are from the same cartel, and their crimes serve a higher purpose beyond just building their reputations. As the campaign progresses and Jobs are completed, the crew can expand their cartel's influence in districts of their choice, with the goal of eventually expanding their cartel's turf when the end of the year comes around and the new turf lines are drawn at the Thiefmoot. Of course, the other cartels aren't sitting idly by waiting for the crew to take control of their districts; the other cartels are spreading their own influence, and the crew must guard against their rivals making inroads to take away control of districts in their turf. A Turf Wars campaign plays out over the course of one year, through 10 Jobs (one per month), with rules for determining which districts are taken over by which cartels. This supplement also includes rules for playing rookie characters. Rookie criminals start out much less competent than experienced thieves, making pulling off Jobs all the more challenging. Rookie characters advance after each session, growing more skilled and more survivable as their careers go on, allowing for gradual character growth over the course of the campaign. Rookie characters can be played in Turf Wars campaigns, or in campaigns using the rules from the Dusk City Outlaws core game.